Most testing tools (including JMeter) include a GUI with record/playback capabilities that require some coding to further customize scripts. NeoLoad is different from other load testing solutions in the market because there’s no coding required. In addition, NeoLoad facilitates automatic execution of correlations at the end of each recording. Parameterization and randomization of variables takes just a few clicks, and logical actions are all drag-and-drop. Former users of script-based tools like JMeter tell us that using NeoLoad results in up to 10 times faster test design compared to what they were used to. JMeter users know how long it takes to maintain scripts that break whenever their applications change. What good is running automated performance tests if your scripts break, and your fixing effort takes forever? That’s why NeoLoad provides a user path update feature allowing you to update a designed script with a quick recording, automatically retaining variable extractors; this makes the script maintenance process significantly faster so that performance testing can keep pace with current Continuous Integration/Continuous Deployment environments. Neotys has a consistent track record for enhancing NeoLoad with new web protocol support – months (sometimes years) ahead of many other vendor’s tools, including Open Source tools like JMeter. This improves TCO because you don’t have to spend time and resources hand-coding a workaround to include these new technologies as they become available – NeoLoad supports them out-of-the box. Of course, the hallmark of a great load testing tool is not just its ability to incorporate a particular technology; it’s how well your tool is able to test it. Many current NeoLoad customers were once JMeter users who made the switch because NeoLoad was able to more accurately capture and replay traffic from applications utilizing technologies like HTTP/2, WebSocket, GWT, Oracle Forms, Flex, and adaptive bitrate streaming. The cost of making changes to test scripts for each app, every time the server gets updated, can really impact the cost of ownership. Labor efficiency gains s in this area are most impactful to the TCO, and can result in the majority of cost savings over time. Speed of Test Design and Test Maintenance – NeoLoad customers often tell us the best part of using the product is that they are able to execute more performance testing in less time. The payoff? 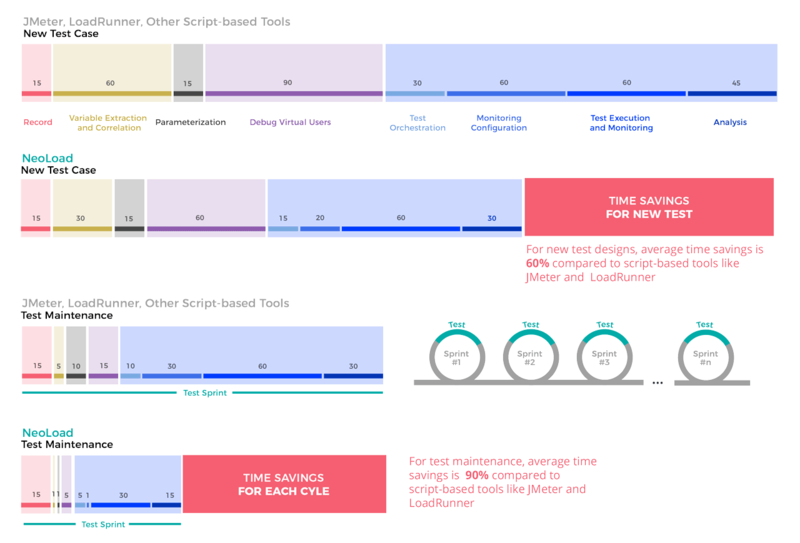 Customers tell us they’re five times (5x) faster at designing tests than they were with script-based tools like JMeter. How is NeoLoad better than JMeter? Monitoring must be set up using listeners and often requires the installation of a remote agent. Graphs are very inflexible, difficult to build meaningful graphs that show actionable results. NeoLoad includes out-of-the-box monitoring for 40+ platforms. Monitoring is agentless so no need to install something on a server that will be monitored. Intuitive drag-and-drop graph builder makes it easy to build complex graphs with multiple metrics across multiple tests. Reporting is very limited in JMeter and requires plugins. Very difficult to take custom built graphs and output those into a customized report. No built-in functionality to compare multiple test runs in a report. NeoLoad’s special comparison report is available to directly compare two different test runs. Custom built graphs can be included in any report.